The Rays previously said they have no interest in getting into the real estate business, but they commissioned a study on real estate opportunities in Ybor City. 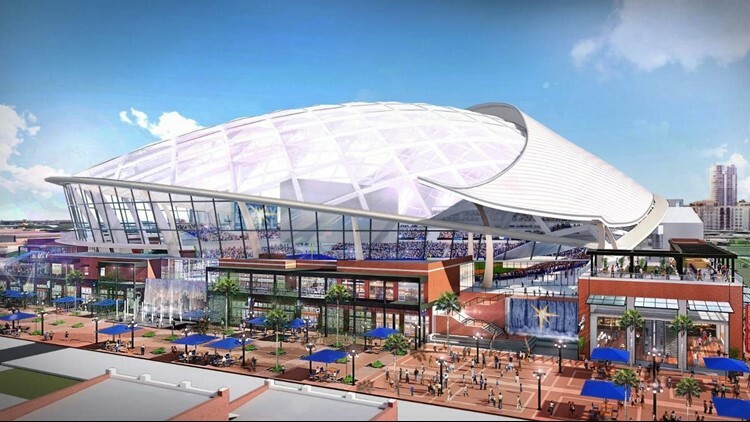 TAMPA BAY, Fla. – A private study commissioned by the Tampa Bay Rays sheds light on the type of development the team was – and still may be – targeting around a new ballpark in Ybor City. 10Investigates obtained the May 2018 report through a public-records request to the Tampa Sports Authority, which has assumed the position of lead public agency on Tampa stadium conversations. The report by RCLCO Real Estate Advisors details growth and development opportunities around Ybor City, including a possible new hotel, conference center and music venue adjacent to a stadium. It also goes into detail regarding what a new Ybor City ballpark district would look like, with entertainment-oriented retail stretching west to Union Station, on the edge of downtown, and mixed-use neighborhood development stretching east all the way to 22nd Street. The report indicates the development would be comparable in size and characteristics to ballpark districts in San Diego, San Francisco, and Washington, D.C. The report also identified Tampa Bay’s largest areas of growth. No area had more apartment growth between 2010 and 2017 than the greater University of South Florida area; downtown St. Petersburg, downtown Tampa, Mid-Pinellas/Carillon, and Brandon also experienced intense growth. For areas with intense growth in office space demand, the report indicated downtown St. Petersburg, downtown Tampa, and Westshore were tops between 2010 and 2017. Read the entire report, posted below. The Rays recently stated publicly their plans to build in Ybor City were dead, but several elected leaders told 10News the statement may have been a negotiating tactic to get Hillsborough County to improve its offer. The Rays continued to ignore 10News’ requests for comment.